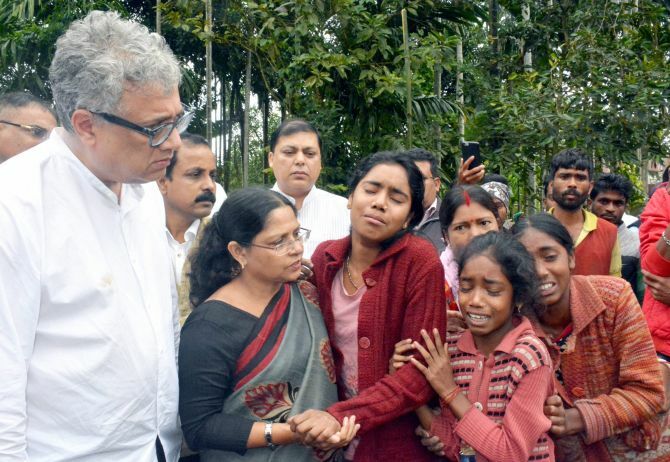 A four-member Trinamool Congress delegation on Sunday met the family members of the five people killed by suspected terrorists in Tinsukia district of Assam, and demanded that the perpetrators of 'hate crimes' be immediately brought to book. "This is a humanitarian visit. This is a visit to stand with the grieving families," the TMC leader had told reporters earlier Sunday outside the airport in Tinsukia. On Friday, West Bengal Chief Minister Mamata Banerjee expressed anguish over the killings and said an 'environment of violence' was prevailing in the country. Assam government on Sunday handed over cheques of Rs 5 lakh as compensation to the families of each of the five persons killed in Tinsukia. Bharatiya Janata Party MLA from Sadiya, Bolin Chetia, visited the victims' houses and gave the cheques. "I have handed over the cheques that the state government had announced after the massacre," Chetia told reporters after meeting the victim families. The Assam government had announced a compensation of Rs 5 lakh and a job for the next of the kin of the deceased.